Arguably the rarest job in the brewing industry is being advertised for the first time this century by a North Yorkshire brewery. Masham-based T&R Theakston Ltd, which still makes traditional oak casks to store and transport its famous ales, is looking to recruit an apprentice cooper to learn the highly-skilled and ancient trade of cask making. The new recruit, who will be the only apprentice brewery cooper in the country, will undergo a three to four year training period in order to produce, re-make and repair the family-owned brewery’s wooden casks. The trainee will learn the craft from Jonathan Manby – who joined Theakston’s as an apprentice himself in 1995 – and is the country’s last remaining brewery-employed craft cooper. Jonathan makes hundreds of oak casks each year for licensees that insist on having their ales served in oak casks. 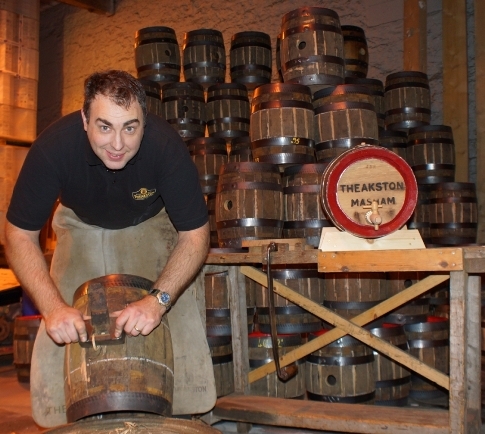 He also demonstrates his skills in the brewery’s cooperage – which is one of the highlights of Theakston’s visitor centre tour – and at fairs, festivals and shows all over the country. “We are very proud to be one of the last breweries in the country to supply our ale in wooden casks and also to be preserving an ancient and skilled art. “Tradition is respected not only in the brewing industry but in thousands of pubs throughout the country. We know consumers strongly approve of the idea of beer served from wood and we plan to continue that tradition. “We have been using wooden casks since the company was founded by my great, great grandfather 187 years ago. The last time we advertised for this position was in 1995, and Jonathan Manby was the successful applicant. “Watching Jonathan at work is fascinating and he uses the same methods and tools to create casks that coopers have used for hundreds and hundreds of years. “The growing popularity of our cask ales means that Jonathan now requires another pair of hands to help him in his important job. However, coopering is a skill that cannot be learned overnight, and the training period can take up to four years. Applicants will require a keen eye and aptitude for detail to joint, raise and bend staves, to size casks and finish to a high standard. In addition they will be trained in all areas of cellar work and beer dispense. The starting date is October and interested parties should apply in writing to Jonathan Manby, Cooper, T&R Theakston Ltd, The Brewery, Masham, Ripon, HG4 4YD. Closing date for applications in July 25.